Liverpool kept their hopes of a Champions League place alive with their first Premiership win at Anfield for four months. El-Hadji Diouf and Michael Owen struck either side of half-time to boost Liverpool and leave Bolton harbouring serious relegation fears. Liverpool did not produce a display designed to celebrate their Worthington Cup win against Manchester United in Cardiff. But Gerard Houllier's side performed with typical efficiency to run out comfortable winners. Liverpool boss Houllier surprisingly opted for Vladimir Smicer to take the place of injured Emile Heskey ahead of in-form Milan Baros. And inspiration was sadly absent in a dismal first half only illuminated by Diouf's 44th-minute goal. Bolton survived in relative comfort, apart from Sami Hyypia's header from a Dietmar Hamann cross which flew agonisingly wide. Jussi Jaaskelainen made an brave double save from Owen and Smicer, but the Trotters more than held their own in the early exchanges. And the Premiership strugglers had an opportunity of their own when Hyypia's poor header set up an opportunity for Bernard Mendy, but he missed his kick completely. Liverpool broke the tedium - and the deadlock - after 44 minutes with a goal that was very much the creation of Owen. He escaped Simon Charlton inside the area, and his chip over Jaaskelainen looked goalbound, but Diouf made sure with a header. Bolton's players were furious, claiming Diouf was offside, but referee Graham Barber waved away their protests. Allardyce's side were undaunted and Ivan Campo should have equalised after 52 minutes, but shot wastefully wide after good work by Youri Djokaeff. Owen responded with a surging run that took him past three defenders before he lost control. But he made no mistake after 67 minutes to double Liverpool's advantage by scoring for the fourth successive game. 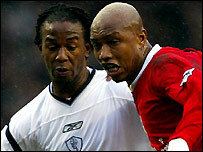 This time Diouf was the creator, setting up Owen, who finished with typical efficiency. Liverpool: Dudek, Carragher, Traore, Hyypia, Riise, Gerrard (Diao 72), Hamann, Murphy, Diouf, Owen, Smicer (Cheyrou 57). Subs Not Used: Arphexad, Baros, Biscan. Bolton: Jaaskelainen, N'Gotty, Bergsson, Laville, Charlton, Mendy (Andre 61), Campo, Okocha, Gardner, Salva (Nolan 70), Djorkaeff. Subs Not Used: Frandsen, Barness, Poole. "We needed to focus today"
"We didn't take our opportunities"